Add a comment below to share your thoughts with Amelia's family. Please include your name and city. You are such an example of faith. You have a beautiful family and what a wonderful thing knowing you will all be together again. I pray for your family and that you may heal. We hope your family has blessings and comfort to get you through this. We love you and pray for you. Your faith is above all. Your little Amelia is a precious child of God. Thinking of your family, trying to wrap my love around you through prayer and thoughts. Thank you for sharing Amelia with us; you are a strong witness for Jesus and spread His light and love. Prayers go out to you during this challenging time. A very special and memory filled tribute to Amelia. My deepest sympathies with thoughts and prayers to your family (Shah). You've done a wonderful job on the website, once again. Little Amelia is such a beautiful little girl, and I'm sure she feels very lucky to be a part of your eternal family. Thank you for sharing your experiences (I can't even imagine how difficult it has been), and especially your faith, your testimonies, and your love for your sweet angel babies. Your family will be in our thoughts and prayers. Much love and hugs to each of you. We love you guys. I am sorry your family has to go through such difficult times. We will be praying for your family that the spirit will be with you through these difficult days. Mike, This is a beautiful website and tribute to your children. Your strength and faith are inspiring! What a beautiful way of celebrating your daughters' lives and the spiritual growth of each of you. So many of us have been blessed because of what you have shared and continue to share with us. Thank you. My heart goes out to you at this challenging time. I am touched by your faith and eternal perspective. It helps me face my own life and challenges with more hope and faith. Thank you for sharing your strength and testimonies with all of us. Your courage and love is inspirational and uplifting. Your family is absolutely beautiful and Milli and Hope both look like they came as perfect angels. Thank you again for reminding me of all that is truly important at this time of our Savior's birth. May you have a beautiful Christmas and a wonderful New Year! I am so sorry to hear about your loss! But very inspired by your acceptance and bravery, I could not help but shed tears as I looked over your website, your family has great strength and love and for that you are blessed, Amelia is a beautiful baby girl and I wish that I could have gotten to see her play at playgroup. 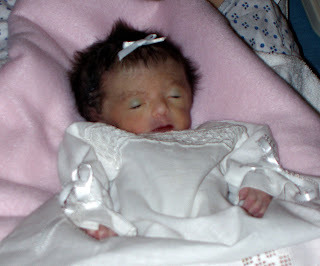 You have set up a lovely website to honor her memory and have given your audience good insight about Trisomy 18. I wish your family all the best and pray for the day that you reunite with Hope and Amelia. You have such a beautiful family!! I am truly saddened by your loss and my thoughts and prayers are with you. Amelia is such a beautiful little girl! Please leave your name and city.